The National Weather Service has issued a new Winter Weather Advisory, backing off their more dire predictions as warm air approaches from the south, likely changing the snow fall later to rain. Winds will pick up tonight. The frozen ground and snow, slush and ice on the roads will keep driving hazardous on side roads and remote areas. They note that the forecast is complicated. Snow, mainly after 10am. High near 35. Wind chill values between 24 and 29. East northeast wind around 8 mph. Chance of precipitation is 80%. Total daytime snow accumulation of 1 to 2 inches possible. Rain and snow, becoming all rain after 10pm. Low around 35. Wind chill values between 24 and 29. South southeast wind 14 to 21 mph, with gusts as high as 26 mph. Chance of precipitation is 100%. Little or no snow accumulation expected. Rain before 10am, then showers likely after 10am. High near 38. Wind chill values between 24 and 29. South southeast wind 10 to 15 mph, with gusts as high as 20 mph. Chance of precipitation is 90%. New precipitation amounts between a tenth and quarter of an inch possible. Showers likely, mainly before 10pm. Mostly cloudy, with a low around 32. Wind chill values between 23 and 28. Breezy, with a south wind 17 to 25 mph, with gusts as high as 33 mph. Chance of precipitation is 60%. New precipitation amounts of less than a tenth of an inch possible. A chance of rain and snow showers before 10am, then a chance of snow showers. Mostly cloudy, with a high near 36. South southwest wind 7 to 12 mph becoming north northwest 16 to 21 mph in the morning. Winds could gust as high as 26 mph. Chance of precipitation is 30%. New snow accumulation of less than a half inch possible. A 30 percent chance of snow after 4am. Partly cloudy, with a low around 30. New snow accumulation of less than a half inch possible. A chance of rain and snow before 10am, then a chance of rain. Partly sunny, with a high near 40. Chance of precipitation is 30%. Little or no snow accumulation expected. Showers likely. Mostly cloudy, with a low around 34. * WHAT...Snow expected late this afternoon and tonight with accumulations of 2 to 4 inches likely. Heavy snow accumulations of 5 to 10 inches are possible Monday afternoon and Monday evening before precipitation possibly mixes with freezing rain, rain or sleet. * WHERE...Portions of west central Washington. * WHEN...For the Winter Weather Advisory, from 4 PM this afternoon to 4 AM PST Monday. For the Winter Storm Watch, from Monday morning through Tuesday afternoon. PRECAUTIONARY/PREPAREDNESS ACTIONS... A Winter Weather Advisory for snow means periods of snow will cause primarily travel difficulties. Expect snow covered roads and limited visibilities, and use caution while driving. 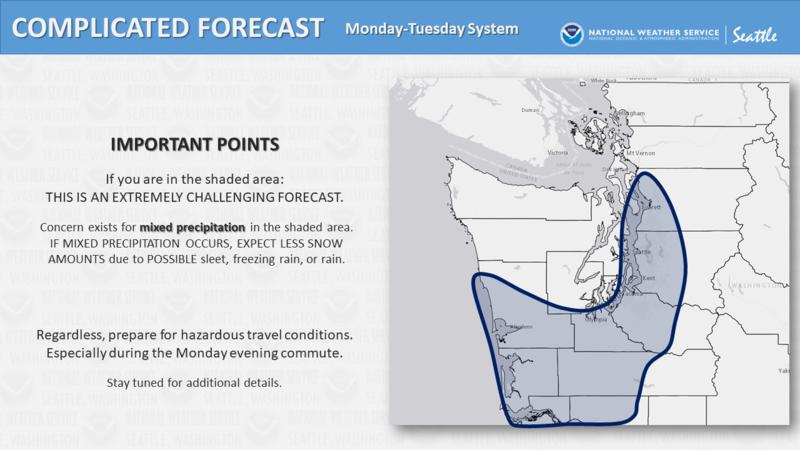 A Winter Storm Watch means there is potential for significant snow, sleet or ice accumulations that may impact travel. Continue to monitor the latest forecasts. For the latest road conditions in Washington state, call 5 1 1.